Sacred Sound Tools and Sacred Ritual Pieces from the Four Corners of the World ! Our annual Sacred Sound Retreat explores both ancient and modern knowledge concerning the role that sound and vibration plays in this universe and our physical lives. Our program presents the History, Culture, and Uses of vibrational instruments, the Human Voice, Shamanic Practices and Philosophies. This is coupled with a hands on learning experience. Students will work with instruments from Tibet to New Guinea, Nepal to Brazil, China to New Zealand, Tuva to Australia; indigneous instruments and sacred ritual items from the 4 corners of the world. 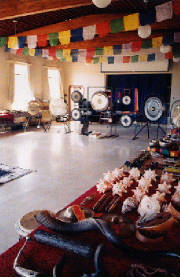 We will have over 20 Gongs with us, as well as Native American and Himalayan Drums. 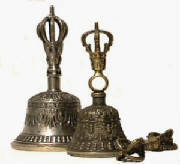 Buddhist, Bon, and Shamanic ritual pieces. We will explore the works of Jenny, Tomatis, Chladni, Pythagoras, Hermes, Stapp, Rife, Bohm, Pribham, Bohr, Emoto and more. We have selected Taos Mountain Center in Taos, New Mexico to host this year's event. This beautiful high altitude location will not only be a wonderful backdrop for our program, but will afford us the opportunity to launch an optional day trip to Puye Cliff Dwelling, Rio Grande Gorge, or Chaco Canyon. This will enable us to work directly with the Earth Spirits and Ancestors by making offerings, and connecting through our sound tools and with prayers. Our next western USA 5 day Retreat will not be until 2006. This series of classes and workshops are designed to assist the student, artist, or practitioner to gain new perspectives and experiences through the ancient world of sacred sounds, vibrational healing, and meditation; with centuries old, authentic tools and techniques. Our Retreats are organized to consolidate a diverse group of gifted individuals within an atmosphere that is Academic ( in Knowledge ), Shamanic ( in Nature ), and Sanctified ( for Respect to All ). You will gain invaluable experience with these instruments and these Shamanic, Buddhist, and Bon avenues of training and perspectives. This approach gives you a solid foundation in sonic applications, vibrational healing, and shamanic and enlightened meditative practices. This is our 11th annual Retreat. Our past Retreats have been a joyful, at times intensive, but always a transformative event that can allow for New Perspectives and New Directions to emerge in one's personal and professional life. This is truly a unique and unforgettable experience. As always, our 5 day event features new and exciting workshops as well as new updates on sonic technologies. We may have a Special Guest or 2 !